Confession: I have been holding back on you. Please don't be mad. It's just that I've been so focused on my veganic garden (tragedy struck yesterday...something ate SIX of my tomato plants right down to the stems!!) and on getting my computer fixed (which didn't happen...just got my computer back from computer dude who was not only unable to extract anything from my hard drive, but also was unable to reinstall the backup files so now I have to start all over!!) that I've let a few fun things slip by without telling you. I'm here to make up for that. Over the next four days, I'll be posting two awesome creative projects, one awesome creative session, and one awesome adventure. "Awesome" is subjective, of course. I think they are awesome and since this is my blog, I guess that's what counts the most. First up: creative project #1. My friend Ann told me about a book she recently bought which was written by her graphic design instructor, Erin Zamzrla, called, At Home with Handmade Books. 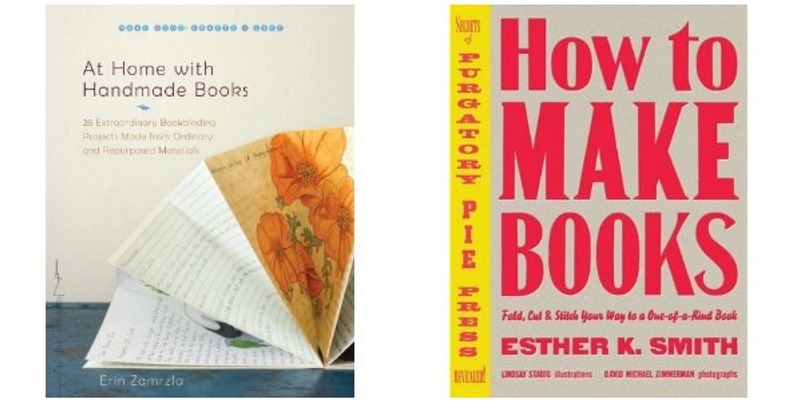 Now, I already have a wonderful bookmaking book by Esther Smith called, How to Make Books. I love this book for so many reasons (the book itself is letterpressed, has great illustrations, is full of wonderful ideas that don't require complicated tools), but what it lacks is binding techniques. And understandably so. Binding is a whole other beast. When I've taken bookmaking classes, the hardest part of the class is putting into words how to do the binding (you usually don't GET it until you see the instructor DO it), especially if it's one of those fancy, exposed ones that are stunningly beautiful (check out this artist's Etsy store). The point of How to Make Books is to show how easy it is to publish your own work in various book forms. At Home with Handmade Books, on the other hand, is more about the ART of bookmaking (stepping outside the formal concepts of "book") and contemporizing a traditional binding technique called Japanese stab-stitch. And that is what compelled me to buy At Home with Handmade Books; I really liked the graphics used to describe the various stab-stitch techniques. So I thumbed through the book several times admiring the photography (gorgeous), reading through the instructions (great detail), and trying to figure out which book project to make first (so many unique ideas!). 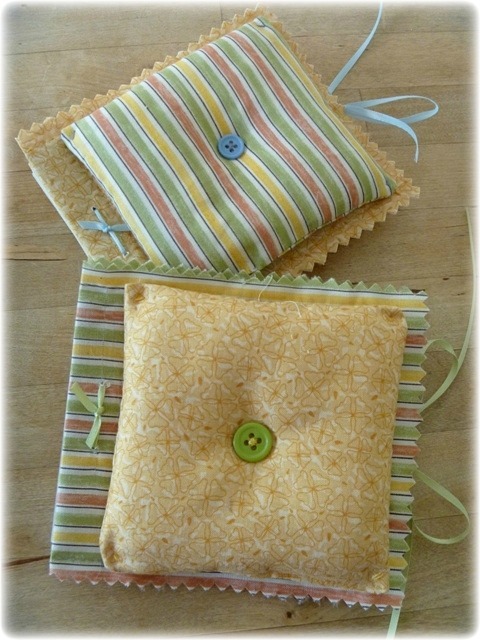 Since what drew me to the book in the first place was the stab-stitch technique, I thought for sure the first book I would make would involve that. But alas...another book project jumped out at me that I just had to do. 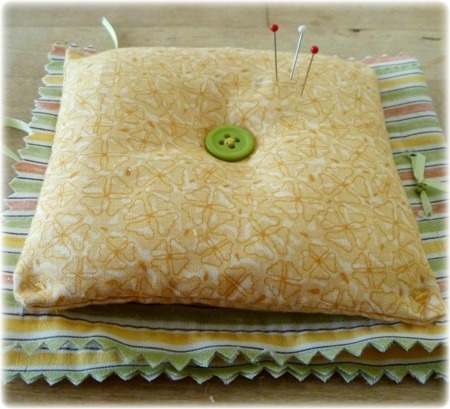 This is the "Sewing Notions Pincushion Book," as it is called in the book. I prefer to call it my "Quilting Notebook." I made two of these, one for me and one for my aunt, who taught me how to hand quilt this winter. It took me about a day and a half to complete them both, mostly because everything is hand stitched. The instructions in the book tell you to machine stitch and I'm sure if I had a sewing machine, it would have taken just half a day to finish up both of them. 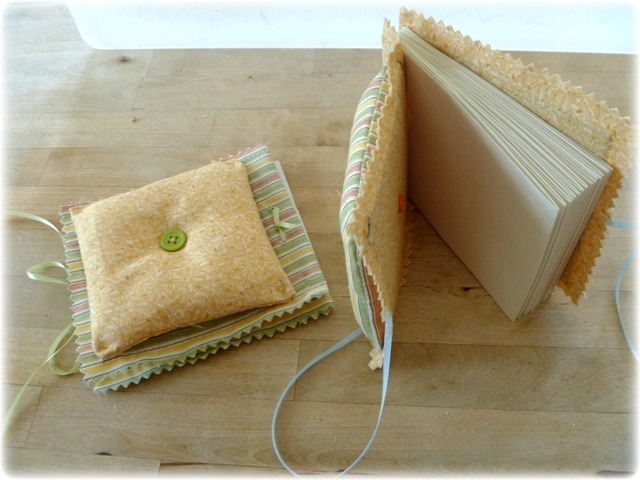 So the cover of the Quilting Notebook serves as your pincushion and inside are 15 blank pages to jot down notes. As I've been quilting (more on that in another post! ), there are sometimes several days that go by where I don't do a single stitch and when I pick it up again, I often have to try to remember where I left off and what it was next that I needed to do. I started writing this stuff down on pieces of scrap paper and pinning it to whatever section I was on. But now, I have a lovely little Quilting Notebook that fits perfectly inside my quilting tin or the pocket of my quilting bag. It's simply adorable! It is obvious that the author, Erin, is not only creative (as I mentioned before, there are some really fun projects in this book), but she's clearly an instructor and very good communicator. Each project comes with detailed, step-by-step graphics and instructions, making it nearly impossible not to succeed. I'm really excited to tackle two of her other projects in the book soon. I'm also excited to apply the various stab-stitch binding techniques she outlines to my own journals that I'm making. So that's how I spent some of my time last week as I tried to distract myself from the healing poison oak blotch on my right leg and my messed-up computer situation. Tomorrow I'll share with you the results of my "awesome creative session."